I have toum, what can I do with it? Keep refrigerated, may separate slightly, just mix together before use. Good for at least 1 month. I’ve had many people ask questions regarding toum from how to use it (see above), how much to use and alternative oils to use. I’ve listed some here and I’ll continue to add as I receive more. Please leave your comments below for others to read with adjustments and modifications. That is the best way for information to be shared. Can I use another oil instead of canola/vegetable? The biggest thing is to make sure you are using a neutral oil. The garlic is what you want to shine, not the taste of oil. Other neutral oils to consider are: avocado and sunflower. A very light olive oil may not be terrible but it will definitely change the taste. I only use Coconut Oil, will that work? I have had one person use liquid coconut oil to stream into her toum and she did have success. However, since coconut oil solidifies in the fridge, the toum also hardened. Not a huge deal, just needs to warm up to soften back to the correct texture. How much should I be using when cooking? Really this is a personal question. When I’m using it as a marinade I’ll tend to use a bit more, for example grilling 2 pounds of chicken breast, I’ll probably use close to a 1/4 cup. If I’m making a salad dressing, just a teaspoon or so. Roasted potatoes, full sheetpan full, probably a few tablespoons. Once you start using it you’ll know your preference and what works best for you. But also remember you’re using this as BOTH flavoring and your oil to saute or coat your food. Do I need any other seasonings? Again, I think that is a personal preference. If I’m cooking with toum, I’ll use it as my garlic for my dish but sure, I’ll add other spices based on what I’m making. If I’m using it for garlic bread, I’ll smear on my bread and just top with cheese. Personal preference. 4 cups of oil is a lot, is this healthy? Is anything really healthy for you in large quantities? No, everything in moderation! This recipe with 4 cups of oil yields about 2.5 pounds of toum. That’s a quite a lot! Think 2 containers of mayonnaise you’d buy at the store. You’re not eating it like yogurt, you’re using in smaller quantities for larger meals. Again, everything in moderation, but do what is best for your family. 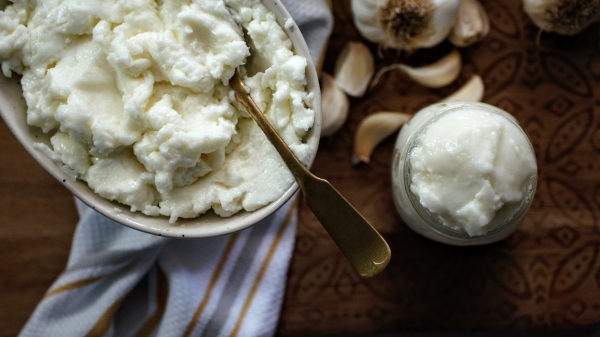 Toum is raw garlic emulsified, so yes, there are a TON of amazing health benefits associated with it. 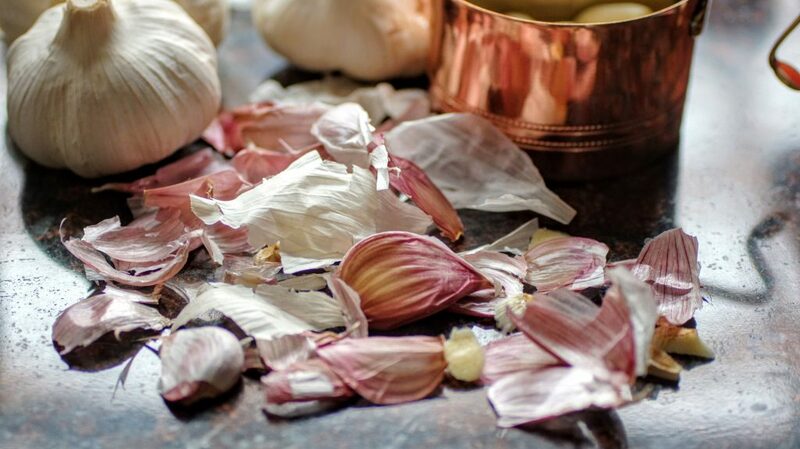 I’m not a doctor or a nutritionist but in the words of my wise Lebanese family, garlic heals most everything. Consider this an elixir to help with anything from the common cold to digestive issues. Let me begin by stating the obvious, if you don’t enjoy garlic, we may not be able to continue our friendship. In all seriousness, onions and garlic are the base to almost EVERY Lebanese savory dish. One of the most versatile and delicious condiments used is toum. Toum is essentially emulsified garlic. It is very strong but extremely tasty, especially paired with chicken, potatoes or really anything that could use a little garlic kick. It is also a great base to use in soups, stirfrys and salads as well as an excellent marinade. Because it’s emulsified, sometimes it doesn’t always stay as a congealed solid, like a thick mayonnaise. Often times, especially during the process of making toum it will separate. BUT, the good news is, even though it’s not the thick creamy goodness, it is still AMAZING to taste and use with your food preparations. So don’t despair if you don’t get it the first time. It’s best to eat toum with some pita bread, think of this as a condiment or dipping sauce. A little bit goes a long way! If you plan on eating toum, be sure your significant other knows and also consumes copious amounts so you both smell like a garlic factory! As you follow along on my cooking adventures, you will see many, many recipes that I will use toum in place of chopped garlic or as a marinade or just to add a bit of flavor. It is such a staple item in our house and has a long life in the refrigerator so I make a big batch and use it for everything. The most classic pairing with toum is chicken. 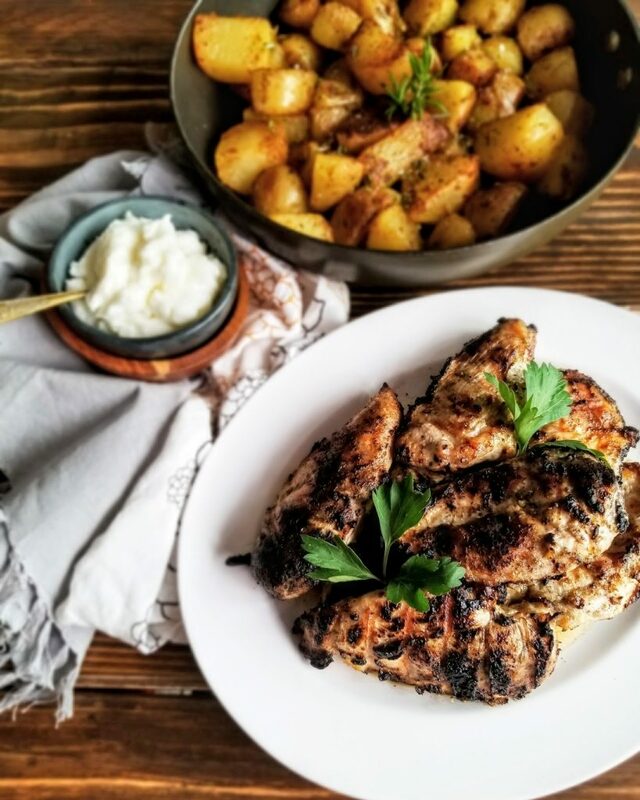 Step into a large number of Lebanese homes on a Sunday afternoon and you will find roasted chicken as one of the many main dishes and served with toum and pita bread. There is really nothing like it, so comforting and homey. With a little bit of garlic, oil, salt and lemon, you will have a most amazing sauce! I would love to see your creations! Tag me on Instagram @CosettesKitchen or post on my Facebook Page. The hardest part of making toum is peeling all the garlic!! Be sure your garlic is FRESH! There should be no green stems inside or coming out, if there is, your garlic is probably not fresh and your toum may not come together. Trim the tops of each piece to remove the bit of stem. You’ll need 1 cup of peeled garlic to make 4 cups of toum. It seems like a lot but believe me, if you’re going to use it for cooking and as a condiment, you’ll be happy you made the full batch. You can always half the recipe too. I measure my garlic in a dry measuring cup. 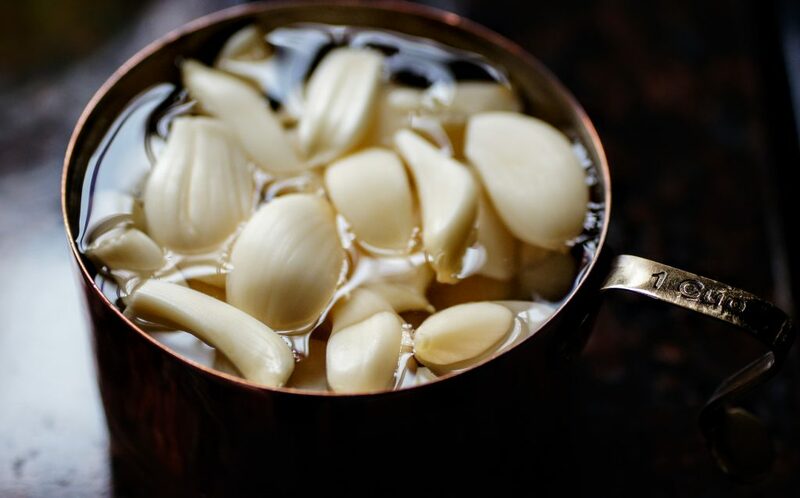 Once you have your 1 cup peeled and trimmed, add enough water to fill the cup with the garlic in there. The water helps to cut the extremely sharp garlic flavor. 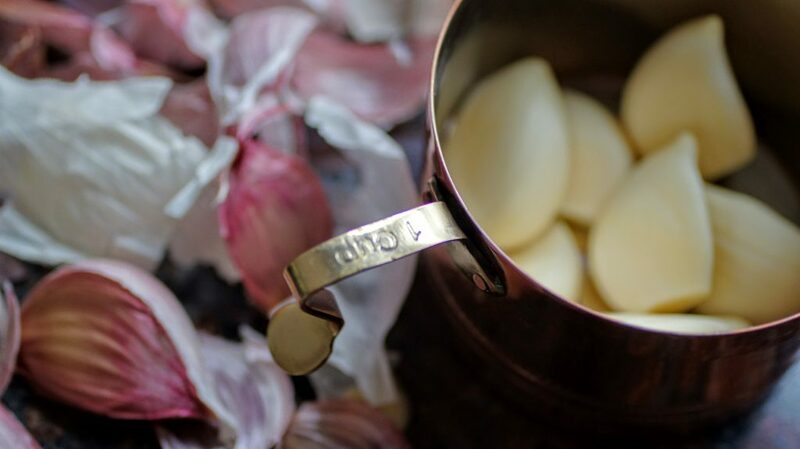 Certain times of year, garlic can be much stronger in flavor resulting in a stronger toum. You can always add a bit more water before processing if you know your garlic is extremely strong. Add your garlic & water mixture to your food processor and process until a smooth paste forms, about 1-2 minutes. Slowly begin to stream your 4 cups of canola or vegetable oil into the processor. I don’t recommend using olive oil as it has a very strong flavor, you want something that is neutral. Some folks have suggested avocado oil, I have not tried it but if you do, please let me know! Just as you finish your oil, your toum mixture should be thickening up. At the very end, add a tsp of kosher salt and finally a squeeze of lemon. That’s it! Remove and enjoy. 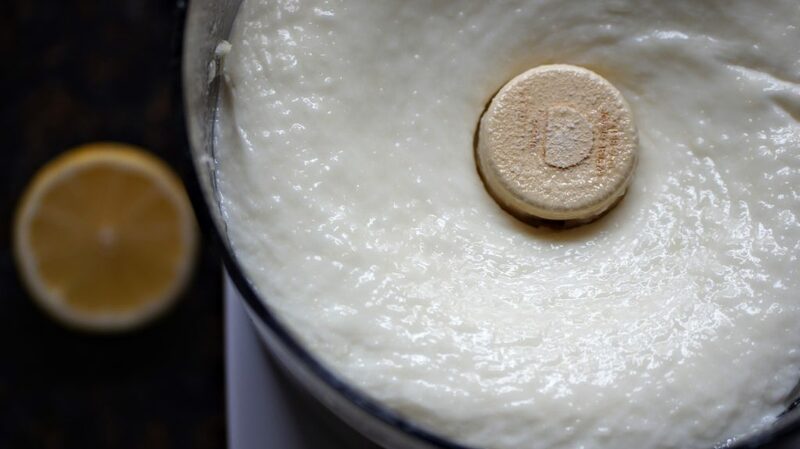 Remember, if your toum did not thicken up like mayonnaise, it is still delicious and useful! Try again next time and hopefully you’ll get the knack. Toum is a traditional garlic sauce used in Lebanese cuisine. Use as a dip or to cook or marinade with. Peel and trim one cup of garlic. Use a dry measuring cup to measure the garlic. Add water to your one cup of garlic to fill the top. Place garlic cloves and water in food processor, process for 1-2 minutes until mixture is processed. With food processor running, slowly begin to stream your oil. 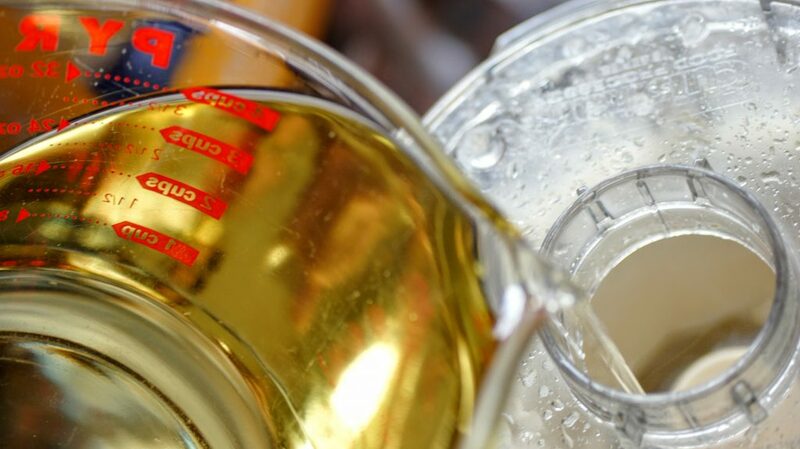 As you stream the oil, your mixture should begin to thicken into a mayonnaise consistency. Once your oil is complete, add 1 tsp kosher salt and a squeeze of lemon. Your done! Enjoy! *Toum should be stored in the refrigerator. It has a long life, can be stored for several months in the fridge. My best find for 2017!!! I eat it every day! Cosette I messed up big time and did not pour in the oil slowly but instead put everything in at the same time and started blending. It came out very runny and not like mayonnaise texture. I have since told myself to read the instructions before making things lol. Anywho is that the trick to making this? I want to try again soon and would like to make it right his time. Thank you dear. to get a thick consistency, you have to keep the blender going and stream in the oil slowly. That is how I make my mayo and it turns out every single time. Fantastic! Thanks so much for sharing that method!!! Dangit! Mine turned out too runny also! I slowed poured in the vegetable oil, so I’m not sure what I did wrong. The only thing I can think of is maybe I used too much water? I do have a question: what speed should we put on our food processor? My options are Low or High. Maybe I processed it too long? It still smells wonderful and I plan on using it for different recipes! Oh no!!! Sometimes it will separate, could be the oil stream, if garlic wasn’t fresh or some other reasons. But yes, it should still be used!!! My food processor only has one speed (Cuisinart) but it is a higher speed so that would be my best guess. Hope it works better for you next time. Oh yum, this sauce is addicting! Thank you for posting it. Oh that’s interesting. I have heard folks using boiled potato! This is just straight toum, nothing else added. Hope you give it a try! I don’t have a food processor. Can I use a blender? I have had some folks use a Vitamix blender with success, I personally haven’t tried it. Worth a shot! Worst case, you have some amazing garlic sauce, just maybe not as thick as toum. Hi I made it in my vitamix came out so thick and good thank you for this amazing recipe. Hello I want to make this but it doesn’t say if a food processor should still be going when you pour the oil in ? Yessss! Pour the oil with the blender/food processor still on. I will update that to clarify. Thanks for checking! This is not only something I love, but the hubby enjoys also! WHAT! As a dip, on bread, cooked on veggies, cooked with chicken….I’m trying it all. I also want to put it on pizza like Cosette does! Holy yum. Yay!!!! I’m so happy to hear this Kelsey! It is a very versatile spread for sure! Enjoy!!! what is the estimated lenght of time I can keep this in the fridge? 4-6 weeks but could go longer if you have it that long. You can also half the recipe to try it out. Hubby likes to mix toum with a little mayo for a slightly different sauce when we eat grilled meats. Oh yessss, we mix with Labneh sometimes. So good! Thanks for sharing! Juice of one lemon? Half a lemon or literally a squeeze of lemon like a tablespoon worth? Cannot wait to try this!!!! Usually about half a lemon, the juice helps to bind the toum together. But it’s pretty flexible.